It’s getting more expensive for retailers like Walmart Inc. to stock its shelves with household staples like diapers, paper towels, and bottled water. The question now is whether that translates into more pain at the check-out line. Soaring costs for transportation and raw materials—some related to tariffs—have prompted Procter & Gamble Co., Nestle SA, Coca-Cola Co. and others to announce price increases this summer on a wide swath of consumer staples. The companies are betting that demand will remain steady even though wage growth is tepid and Americans’ wallets are already getting pinched by higher gas prices during the peak summer driving season. Now it’s Walmart’s move. The world’s biggest retailer faces some hard choices as it prepares to release second-quarter results Aug. 16. It may choose to pass along those price hikes to consumers. But that’s a riskier move nowadays as shoppers can easily defect to Amazon.com Inc. or deep-discounters like Dollar General Corp. and Aldi. Walmart could also play hardball with suppliers, perhaps by demanding rebates elsewhere or promoting its own portfolio of more affordable store-brand products. If Walmart does end up passing along some of the manufacturers’ price increases, it would be a departure from its strategy of reducing price tags across the aisles in recent quarters to blunt the appeal of other grocery chains, particularly the German discounters whose stores increasingly dot the landscape. Walmart executives call the practice “investing in price,” and while it depresses profit margins, it’s widened the price gap between Walmart and rivals in recent quarters, which improves shopper traffic, according to analysts. But those price cuts happened during a record bout of deflation for groceries, which make up 56 percent of Walmart’s U.S. sales. Now, inflation is creeping back, and retailers would prefer to move their prices up in lockstep. But there’s no guarantee shoppers will go along with those plans—they could buy generics instead, or find the same product cheaper online, where prices change on the fly. On average, sellers on Amazon’s third-party marketplace change their prices every other day, according to e-commerce researcher Profitero. “Legacy bricks-and-mortar retailers simply cannot change prices as quickly,” said Chris Walton, an industry consultant. The pricing tension isn’t the only thing weighing on Walmart lately. The tightest trucking market in years hits Walmart just as hard as its suppliers. The employee wage hike it announced earlier this year has now fully kicked in, along with other benefits like a college-tuition subsidy that could cost billions. And it’s still spending like mad to expand its e-commerce business, rolling out curbside pickup of online grocery orders and paying $16 billion to acquire most of India’s leading—yet money-losing—online retailer. Those costs have dented Walmart’s profitability and weighed on its shares, which are down about 8 percent in 2018 after two straight years of gains. Still, most analysts and investors consider the spending necessary amid the encroachment by Amazon and the brick-and-mortar discounters. “If you own Walmart, you have to come to grips with the fact that they have to continue to invest to grab the attention of the consumer,” said Mark Stoeckle, portfolio manager of the Adams Diversified Equity Fund, which owns Walmart shares. 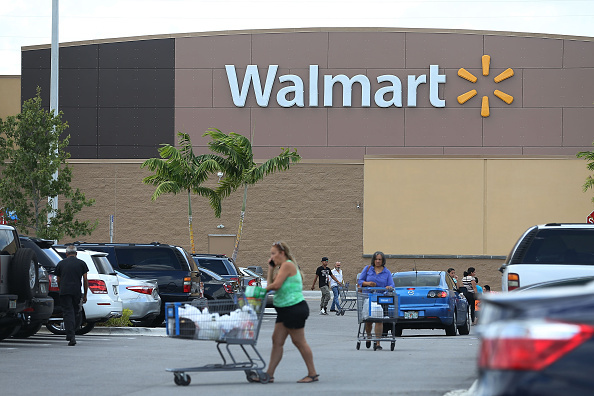 Overall, analysts expect a solid quarterly performance from Walmart, fueled in part by strong sales of summer clothes and other seasonal goods in May, when shoppers flocked to retailers after a wet and cold April. Visits to Walmart stores likely accelerated in the period compared with previous quarters, according to data from Consumer Edge Research. Walmart’s online division should also improve on last quarter’s 33 percent growth, as the company has forecast a 40 percent gain for the full year. “We think Walmart can deliver second-quarter results that keep the stock grinding higher,” Ben Bienvenu, an analyst at Stephens Inc., said in a note. Walmart’s rival Target Corp., which reports quarterly results Aug. 22, will also feel pressure to raise prices. But the Minneapolis-based retailer gets about one-third of its sales from store brands like Cat & Jack or labels that sell exclusively on its shelves, where it has more control over pricing than the typical manufacturer-retailer relationship.